With an estimated wild population in the low thousands the Yellow-shouldered Amazon (Amazona barbadensis) is Vulnerable in the wild. WPT conservation actions: Beginning in 2002 WPT began supporting a series of conservation and research projects to help protect the Yellow-shouldered Amazon on Bonaire and in Venezuela. Progress: In 2001, WPT was contacted by RARE asking for help with a ringing and amnesty initiative to protect the birds on the island of Bonaire, near Venezuela. In 2002 this campaign began, with local nature and environment conservancy organisations, with an event at one of the primary schools. WPT provided a supply of discounted bands, and over 600 pet parrots were banded. Population numbers of Yellow-shouldered Amazons on Bonaire have been increasing for the last decade. By 2015 the population had increased from 350 to over 1000 individuals, where it has consistently stayed for the last few years. The formation of a 'Parrot Club', an after-school group dedicated to the Yellow-shouldered Amazon, has attracted hundreds of youngsters. This, along with the STINAPA Junior Rangers youth group, has galvanized young people on Bonaire to action, to help conserve habitat and parrots. More local involvement is being encouraged with Parrot Experience Tourism, where guides are now being trained to lead groups out to parrots. Thousands of native trees have been planted, with dozens of hectares restored and protected. on Bonaire. In addition WPT has funded the rescue of a number of Amazons and other chicks confiscated and sent to Echo, where they were hand-raised in preparation for release back into the wild. WPT also backed a study, ‘The conservation genetics of the Yellow-shouldered Parrot’, in Venezuela. Where found: Restricted to small coastal area in Venezuela and the islands of Blanquilla, Margarita and Bonaire. Introduced to Curaçao, Netherlands Antilles. 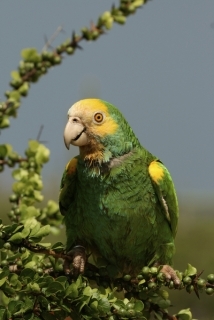 History: The Yellow-shouldered Amazon (Amazona barbadensis) has a fragmented range with seven genetically isolated populations in N coastal Venezuela (Falcón, Lara, Anzoátegui and Sucre) and the islands of Margarita, La Blanquilla, Curaçao and Bonaire (Rodríguez-Ferraro 2009). The mainland population is apparently low. There are reports of a wild population on Curaçao since 1988 (De Boer 2008, A. Rodríguez-Ferraro in litt. 2012). It is now extinct on Aruba. On the islands there were 1,600 on Margarita in 2008 [Briceño-Linares et al. 2011], 100 on La Blanquilla in 1996-1998 [Rodríguez-Ferraro and Sanz 2007], and 650-800 on Bonaire in 2012 [Department of Resources and Planning, Bonaire per R. Martin and S. Williams in litt. 2012]). In 1992, 12 captive-reared birds were reintroduced to Margarita (Sanz and Grajal 1998), which was moderately successful. Ecology: This parrot occurs in areas with cacti and thorny bush and trees; also reported around cultivated areas and around mangroves. Found up to 450m (1476 ft) on Margarita, possibly higher on the mainland. Birds take fruits of several trees and bushes, seeds, nectar rich blossoms, cactus tops, and cactus fruit. They will also sometimes take crops, such as avocado, mango and maize.